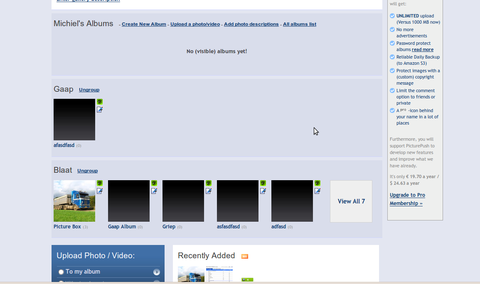 Some of our PicturePush users had problems organizing their albums properly. Therefore we introduce: Album Groups. To add albums to a group, you can click the 'edit' icon next to an album and then choose 'Add to Group'. This will open a dialog to choose the group name (or an existing group) Grouped albums will show under a seperate group header on your gallery index. We moved PicturePush to a brand new server, which should be faster and physically closer to the servers that serve the images, Unfortunately this move did cause a disruption in our service yesterday evening/night. Everything is up and running now, so if you still notice anything strange please let us know. For those interested: it has both solid state drives for the database and normal disks for temporary image storage and 12 GB of ram. The CPU is a lot faster than the one on the old server, so resizing images and recoding videos should be quicker as well. Although we store all your photos twice at PicturePush, this might not be enough to handle small or larger disasters. Therefore we decided that we want to keep your photos even safer. Starting today, all photos uploaded by pro-members will be backed up daily to Amazon S3. It's a very reliable service to store data. It uses multiple datacenters to spread the data, so we feel that we will be able to recover your photos in almost any event. So if you want your photos to be really really safe, upgrade to a pro-account. Today photo sharing site PicturePush reached the 20,000th signup. The site doubled it's member base in just over 8 months. Member number 20,000 received a free two-year upgrade to pro-membership to celebrate. The site started in 2006 and has now grown to hosting over 1.3 million pictures taking up over 2 Terabytes of storage space. All of this using 2 storage/web servers and a database servers which together process the 54 million requests each month. Most of these requests come from Poland, The Netherlands and the USA. Currently the main focus is on increasing reliability and availability. The recent outages have emphasized the importance of this effort. An important step is the addition of very reliable backup for pro accounts which will become effective in the next few days. In 2009 PicturePush will further focus on it's pro-members by introducing more options for publishing and copyright protection. All members will profit from an ever increasing effort in improving usability and the integration with mobile and social platforms. A lot of our beginning users were confused about the difference between the normal upload and the multi-file upload. Furthermore the installation of Java for the latter, posed a problem for some. Therefore we have tried to integrate the two into the new upload page. It is based on swfupload. We hope it is easier to use and more clear what exactly is going on. If you have any problems, or liked the old ones better, please tell us. A reason to celebrate: PicturePush has just received it's 1 millionth upload. It took us two year and one month to get to this point. PicturePush has very much improved since the start in 2006. We like to thank all of our members for using our service and especially those giving us feedback to further improve the site. After a lot of considerations we decided to start a photo printing Beta using ColourMailer. You can now print your photos on PicturePush using the button on the right of the photo. By default you can only print your own photos. However, you can go to your Profile/Preferences and change who can print photos. It can be set to Public, Friends or just you. We hope this is a valuable addition for those of you posting event photos.